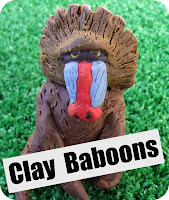 I came across this really cool blog today via Cool2Craft it is called Clay Baboons. The author tells the most amazing stories along with plasticine figurines. It is well worth a look. After reading your comment, I came to visit. What a surprise to see myself on your blog! Thank you so much for the kind words.